To say I love street food would be an understatement. I love eating outside, the smells from various food hawkers mingling in the air as I stuff my face and sauce drips down my chin. I’m not so fond of the the crowds, but getting to see a passionate chef cook my dinner is worth a bit of push and shove. A couple of years ago, in Penang at a char kway teow hawker stall, I got to see a master at work. 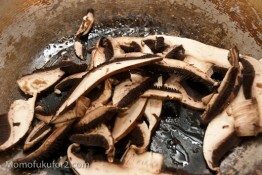 Two heavy oil slicked woks sat on open fires, essential for char kway teow. 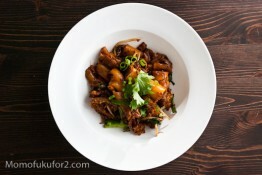 Good char kway teow is cooked on an extremely hot wok which infuses the dish with “wok hei,” which is a term used to describe the fiery flavour. From the way the hawker chef swirled the oil, cracked the eggs and added the flat rice noodles, I could tell he had done this a million times. 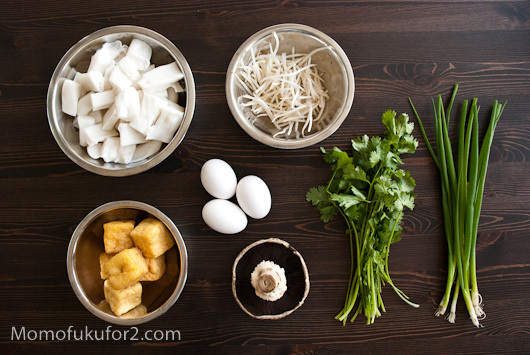 Slippery, smooth rice noodles, savoury soy sauce, seafood, eggs, green onions and bean sprouts danced in the wok before being unceremoniously dumped on a plastic plate. 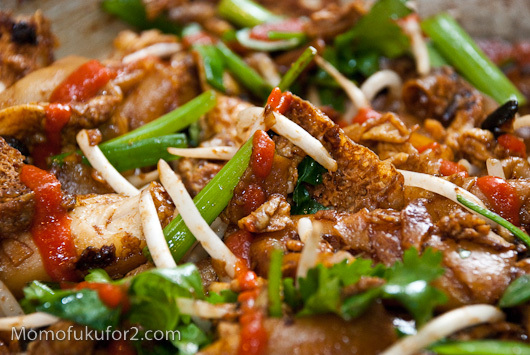 It was the best plate of char kway teow I ever had. I don’t have any open flames at home, but every now and then I like to cook rice noodles. This time, I substituted the flat rice noodles for rice noodle rolls and omitted the seafood. The rice noodle rolls added lots of chewy bite and lime juice added a bit of brightness. Heat up a bit of oil in your wok over medium high heat. Lightly beat the eggs and pour them into the wok and scrabble. Remove from the wok and set aside. Turn the heat down to medium. There should still be some oil in the wok, but if not, add a touch more and the garlic and shallots. Cook until softened, but not crispy. Add the mushrooms and fry until cooked. Remove the mushrooms, garlic and shallots. Turn the heat to high. Add a bit more oil and add the rice noodles, tossing them to heat through and to prevent sticking. Add the soy sauces, tofu puffs, eggs, mushroom, garlic and shallots. Make sure you keep tossing. By now the rice rolls should have some nice char on them so taste and season with the sriracha and lime juice. 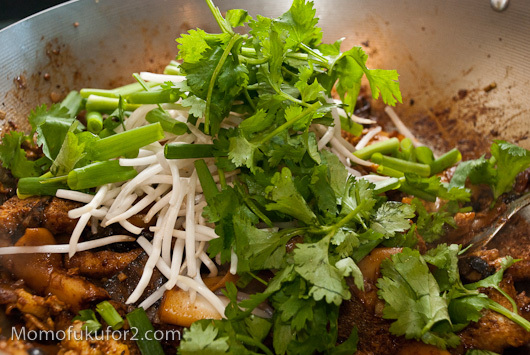 To finish, add the been sprouts, green onions and cilantro and toss briefly. Enjoy hot. Oh YUM. This looks awesome! 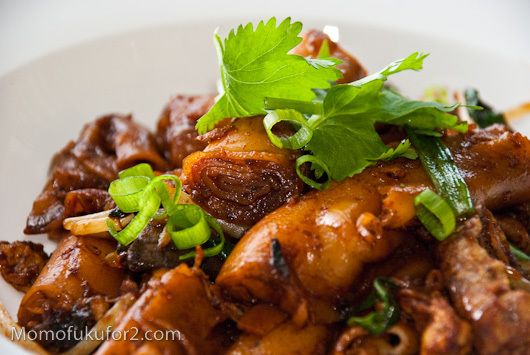 I love the saucy/slightly charred taste of pan-fried rice noodles like this. Yes, the charred taste is the best! 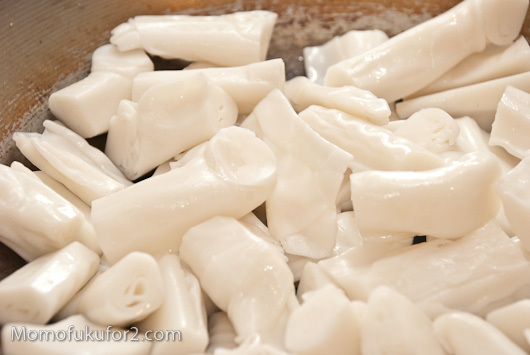 I love nice, thick rice noodles. The doughy chewiness, the way it absorbs flavors. That’s what I love about thick rice noodles too: the bite! Yum. 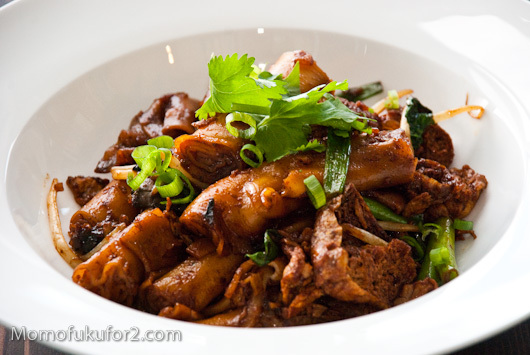 Just had two dishes of XO-sauce rice rolls at dim sum yesterday. Oh, yes, rice rolls with XO-sauce is wonderful! oh my goodness. I want this NOW. Seriously. WOW. I’ll virtually send some your way! omg YUM. I need to stop looking at your posts before I’ve had dinner because I get so hungry!! Thanks for sharing, these rice rolls look AMAZING. OH MY GOSH that looks incredible! Thank you for inspiring tonight’s dinner! I always try to find this at dim places! 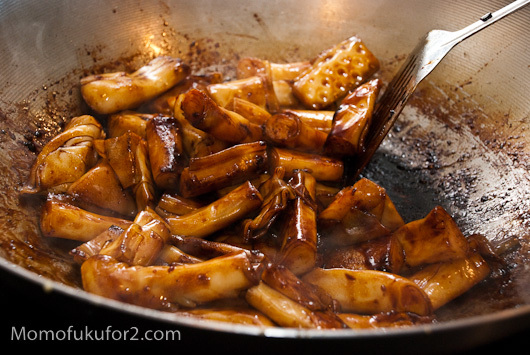 What is the correct chinese-english name for it ! !